Whether using specifically calibrated reflection surfaces, prismatic optics, light pipes or other optical elements, and applying FMVSS-compliant film layers and frosted surfaces, our rear lighting solutions meld these optical concepts to create high-quality, customized lamp appearances. Integrating the primary objective of making cars visible on the road and the design freedom of new technology, FNG Lighting tail lamps are the perfect blend of function and style. Able to achieve all necessary functions, the lamps also give customers the freedom to create signature looks for their vehicles. Our styling solutions allow customers to take advantage of design flexibility and new levels of creativity. No matter the packaging, styling or legal requirements, our solutions include the necessary elements to achieve our customers’ desired look and function. Whether it's coming up with creative ways to leak light through a small aperture, using uniquely oriented LEDs and reflector treatments, or utilizing FMVSS-compliant films and other lighting techniques to achieve homogeneous stop and tail functions, we always work to adapt and accommodate both styling and function requirements. 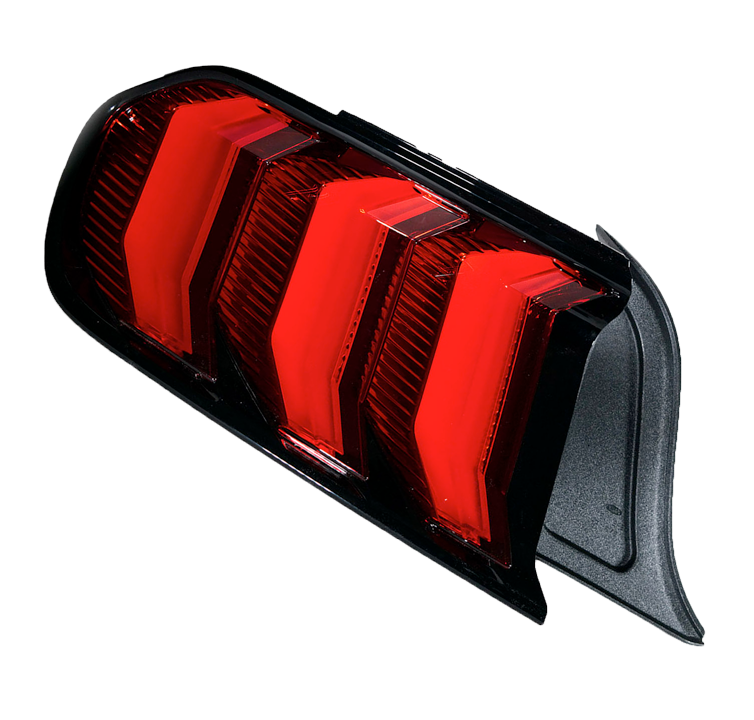 Reflector systems are some of the most efficient optical systems available. We can apply indirect, direct and any other configuration of reflectors, and at any angle (horizontal, vertical, or inclined), in order to achieve the styling and function that our customers require. Light pipes are an amazing way of achieving homogeneous lit appearance in interesting and brand-defining shapes. Applied with LEDs at one or both ends, and with prismatic optics or our patented pad printing technology, our light pipe technology can be customized and adapted to whatever styling specifications are required. Using thick 3-D transparent plastic parts with thin film surface, and using FMVSS-compliant materials, our film technology can create homogeneous elements within a taillamp. Methodology: Challenging packaging requirements were resolved using uniquely orientated LEDs with direct and indirect treatments as well as the first application of FMVSS and AMECA-compliant film material to create a homogenous lit appearance for the tail function. 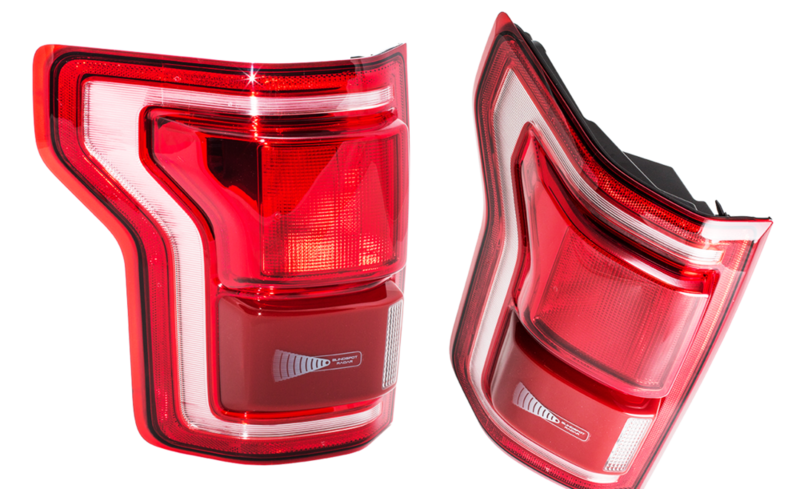 Functioning as a third brake light, our Center High Mounted Stop Lamps (CHMSLs) are created with design innovations and cost-effective engineering at the forefront. The CHMSL opens up opportunities to take on the styling of the tail lamps, using technology like prescriptive lenses, direct reflectors, indirect reflectors and light pipes, among many more. Methodology: Creating a cost effective CHMSL was paramount. The electronics and LED implementation was made more efficient and the reflector and lens were incorporated into a single piece. We were able to achieve a smoother light appearance through an extremely small opening, thereby giving the light a high-price appearance while keeping cost down. Our patented FLEX F/X technology gives our customers’ lamps a one-of-a-kind appearance while achieving all necessary rear lamp functions. Using unique lensing and reflecting technology, along with low-cost LEDs, FLEX F/X can achieve everything from a completely homogeneous lit appearance to an appearance of “explosions”, giving our customers’ vehicles a signature look out on the road.